The NASA Hubble Space Telescope snapshot is centered on the region around the neutron star (the rightmost of the two bright stars near the center of this image) and the expanding, tattered, filamentary debris surrounding it. Hubble’s sharp view captures the intricate details of glowing gas, shown in red, that forms a swirling medley of cavities and filaments. 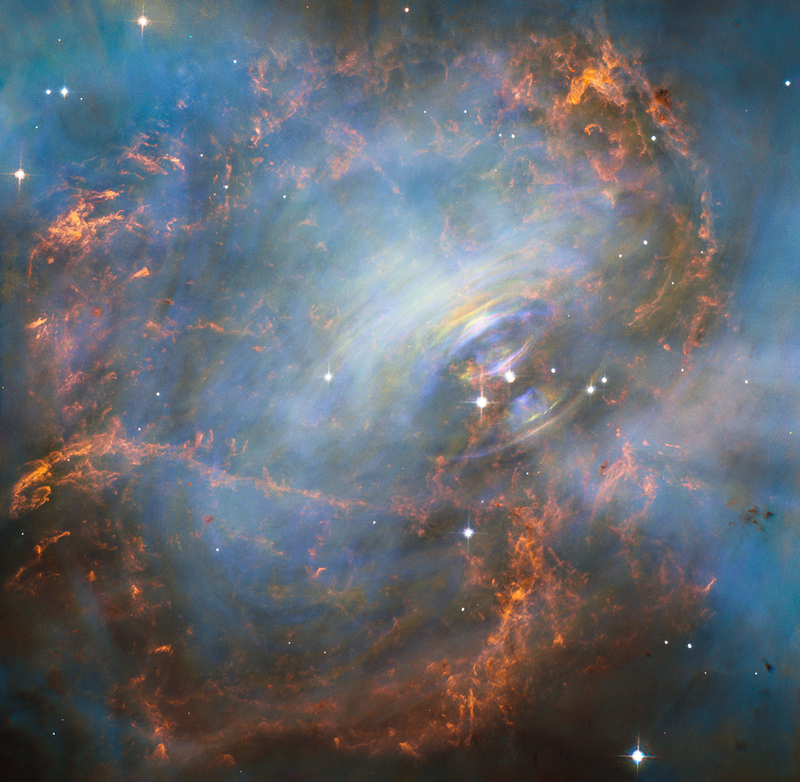 Inside this shell is a ghostly blue glow that is radiation given off by electrons spiraling at nearly the speed of light in the powerful magnetic field around the crushed stellar core. When this “heartbeat” radiation signature was first discovered in 1968, astronomers realized they had discovered a new type of astronomical object. Now astronomers know it’s the archetype of a class of supernova remnants called pulsars – or rapidly spinning neutron stars. These interstellar “lighthouse beacons” are invaluable for doing observational experiments on a variety of astronomical phenomena, including measuring gravity waves.